When traveling to Niagara Falls it's all about the views, but what are the best spots? Here are a handful of places on both the American and Canadian side that offer spectacularly breathtaking views that will make your trip one to remember. The Maid of the Mist is the most iconic of activities to give tourists unforgettable views of Niagara Falls as its history dates back over 170 years to when the first ferry took passengers to the brink of the Falls in 1846. From then on people were hooked. Now, you can take a boat ride from mid-May to early November roughly every fifteen minutes. The tour lasts twenty minutes and takes visitors through the Niagara Gorge, past the American and Bridal Veil Falls, and into the mist coming off of the Horseshoe Falls. It's the only opportunity to get this kind of perspective for each of the three waterfalls that make up the natural landmark and it won't cost you a ton. Admission for adults runs $18.25, for kids six to 12-years old it's $10.25, and children under five are free. If you want to get up close and personal but don't mind getting soaking wet then the Cave of the Winds tour is perfect for you. An elevator takes guests down to the base of the Niagara Gorge where a wooden walkway guides tourists to the base of the Bridal Veil Falls. The proximity makes for a spectacular perspective, looking straight up from the base. Due to weather conditions that can make for a dangerous trek, the tour is only open from May to November. Admission for adults runs $17, $14 for kids six to 12, and children five and under are free. If you're operating on a budget then a stop at Niagara Falls State Park shouldn't be missed. It's totally free and open to the public and offers unobstructed views of the American Falls. While the views aren't as expansive as they are from the Canadian side, the American side allows you to get much closer. For even more unobstructed views there's the Niagara Falls Observation Tower that stretches over the Niagara River from the park that makes you feel as though you're flying. For a luxury dining experience that you won't forget, the rotating dining room on the Skylon Tower is your must-stop spot in Niagara Falls. As the name suggests it doesn't matter where you're seated as the entire restaurant makes a 360-degree rotation each hour, offering constantly changing views of the Falls and Gorge. Luckily, the dining room is open for all meals and is a great option for children as they have an extensive menu that appeals to everyone. It is a little on the expensive side with lunches around $29 per person and dinner entrees starting at $41, but you're also paying for the unforgettable views. Since 1961, Niagara Helicopter has been giving tourists the ride of their lives, up and over Niagara Falls for some of the most spectacular views of their lives. The 12-minute tour takes you up and along the Niagara River, over Queen Victoria Park, over the American Falls, and finally around the curve of the Horseshoe Falls. Adult rides cost $140 each or $272 for a couple, and for children the tour is $87. The Skylon Tower isn't the only restaurant with breathtaking views of the Gorge as The Rainbow Room pairs their contemporary menu with mouth-watering Falls' views. From every seat in the house, you'll be treated to nearly unobstructed views of the entirety of the river, gorge and all three falls through the floor-to-ceiling windows. Again, a restaurant with views like this doesn't come cheap as entrees run around $30 each but it's not every day that you get to dine in a place like this. If you're looking to stretch your dollar a little farther but still want to see all the sights then an airplane tour with Niagara Falls Air Tours is a perfect option. Their 30-minute flight costs $199 but takes you on a tour of the entire Niagara region. 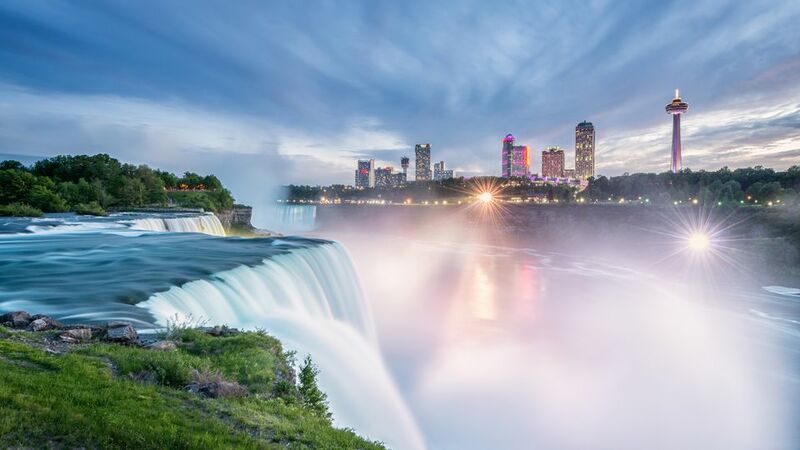 Not only will you see the Falls, you'll also see Niagara-on-the-Lake, Lake Ontario, Fort Niagara and the city of Niagara Falls. It also gets cheaper the more people you bring with you. For two the 30-minute ride costs $259, and for three people it's $389. It's a great option if you're pressed for time and want to see it all, and if you're not afraid of heights.